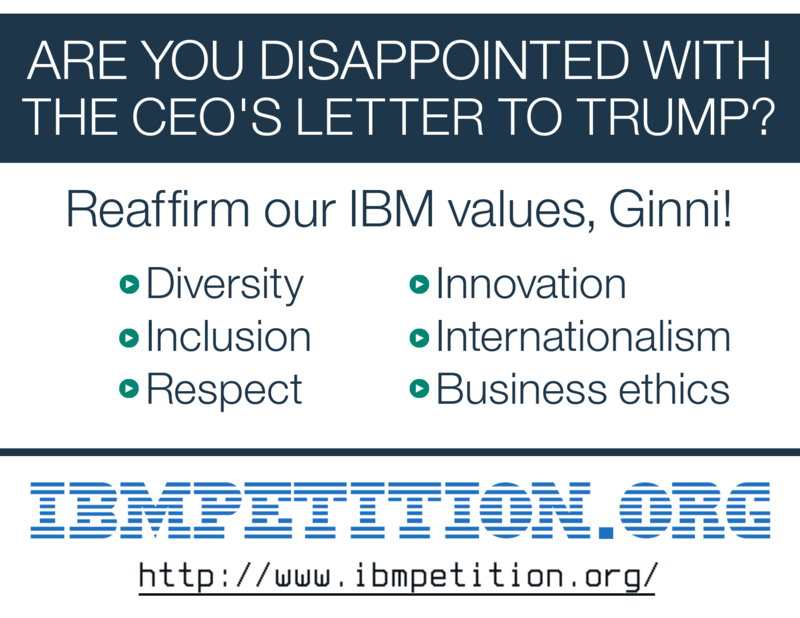 We are disappointed that IBM CEO Ginni Rometty's open letter to President-elect Donald Trump does not affirm IBMers' core values of diversity, inclusiveness, and ethical business conduct. For our mutual aid and protection, we call on IBM to expand diversity recruitment programs, and we assert our right to refuse participation in any U.S. government contracts that violate constitutionally protected civil liberties. We call on IBM to demonstrate commitment to our Business Conduct Guidelines and to prevent perceived influence peddling through Trump affiliated businesses. Lastly, in the present context of insecurity and unpredictability, we call on IBM to return to our traditions of high worker retention and morale by making retirement plans equitable once again. We invite all current IBMers, former IBMers, and community supporters to sign our statement. While we understand your willingness to engage in constructive dialogue with the president-elect, we believe our shared culture and values remain not only constant, but also central to our transformation underpinned by cloud and cognitive initiatives. As you know, more than 400,000 IBMers around the world work in environments where diversity—including diversity of thought—is the norm. IBM values this because our diversity helps create innovation that enhances every aspect of our business. IBM’s leadership in this domain is more essential than ever. If we cannot boldly and openly affirm our commitment to diversity, then who are we? The right thing to do for IBM workers and our stakeholders—which includes every person on the planet touched by our technology—is to emphasize this in writing to public officials. Yet writing is not enough. We have a moral and business imperative to uphold the pillars of a free society by declining any projects which undermine liberty, such as surveillance tools threatening freedom of speech, freedom of assembly, and freedom from unreasonable search and seizure. The kinds of moral decisions you and our senior executives make in the next four years will define our corporate character for our next century. This will be your legacy. We are speaking out at major offices about IBMPETITION.ORG! "CAIR Georgia calls on IBM ... to refuse to participate in any US government contracts that violate constitutionally protected liberties. It's important that IBM listens to its employees and protects them while making its position clear where it stands on certain issues ... Thus far, IBM has not signed the amicus brief against the [Muslim] ban ... We are very concerned that IBM has not signed on." Have you seen this flyer at your IBM office? 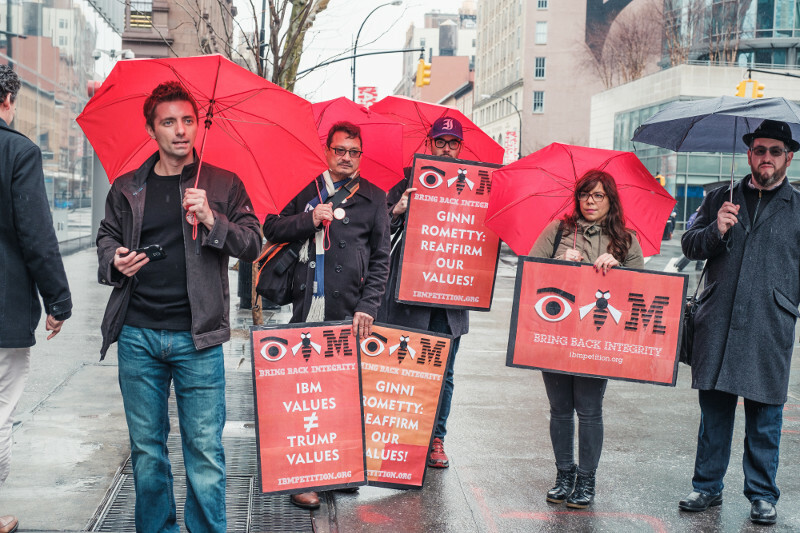 We're building teams of IBMers willing to stand up for our values in IBM offices all over the US -- and the world! Please send photos of your posted IBMPETITION.ORG flyers to ibmpetition@ibmpetition.org! Other tech workers are gathering signatures to urge their bosses to do more. IBM engineer Daniel Hanley, 35, [and a team of IBMers] started a petition in November that now has more than 2,000 signatories, about 1,300 of whom have self-identified as IBM employees, according to Hanley. An IBM spokesperson declined to comment about the petition. Some IBM workers aren't thrilled with CEO Ginni Rometty's advisory role with the Trump Administration, and they want it to stop. A petition circulating among staff and former workers at the usually button down blue-chip IT company beseeches Rometty to reconsider her close alignment with the new president. Rometty, who wrote a letter advocating "new-collar" jobs to Trump in November, is a member of the president's business council. More than 1,600 have signed the online petition. "IBM should know better, and rethink its role in the world," says Elizabeth Wood, 31, who resigned in November as a senior content strategist in marketing at Big Blue after Rometty's letter. "Everyone is signing that (anti-travel ban) brief but them and Oracle." Thanks to fellow IBMers for the support as we reach 2000 total signatures! The Intercept announced the public launch of our petition campaign!